Installation of Jo-Ann Bussiere - Jo-Ann represents Home Town Bank in Lancaster shared she’s our “link to Lancaster.” We are excited and grateful to be able to deepen our connection to the community. Congratulations to Glen for his new job. Dogs2Vets Fest debrief took place on May 30th. The event was so successful that Clear Path in another state is going to do one! April 27,th is booked for next year’s event! Gate income was less than expected but approx. $25,000 raised through sponsors. Different structure of organization will be implemented for next event. Scholarship presentations: Two $2,500 scholarships going out to students at Nashoba Regional High School and one $500 to a student at Minuteman (Howard, Ellen & Glen the leads). Almost all the funds we raise goes back into the community, and this is part of that. June 22-24 is Rotary Youth Leadership Awards (RYLA), a weekend for high school sophomores to learn leadership skills (lead by students). This year being held at Fitchburg State. Volunteers needed! Steve is happy fundraiser for Lana kicked off and raised $1,700 (will go until mid-July). Also working on saving/restoring church in Worcester and happy with the press. Ron is happy her daughter graduates this weekend, sad that Bucknell doesn’t have a 4 year scholarship. Last night’s Rotary Means Business was in Waltham, will be stepping down as Chair to step into new role. Christine enjoyed RYLA awards ceremony with daughter & glad to be here, great way to start the day. Christine has been a member of Bedford Club for 12 years – past president & currently RYLA chair. Tom has been along for the ride, supporting Christine, and now a family member. 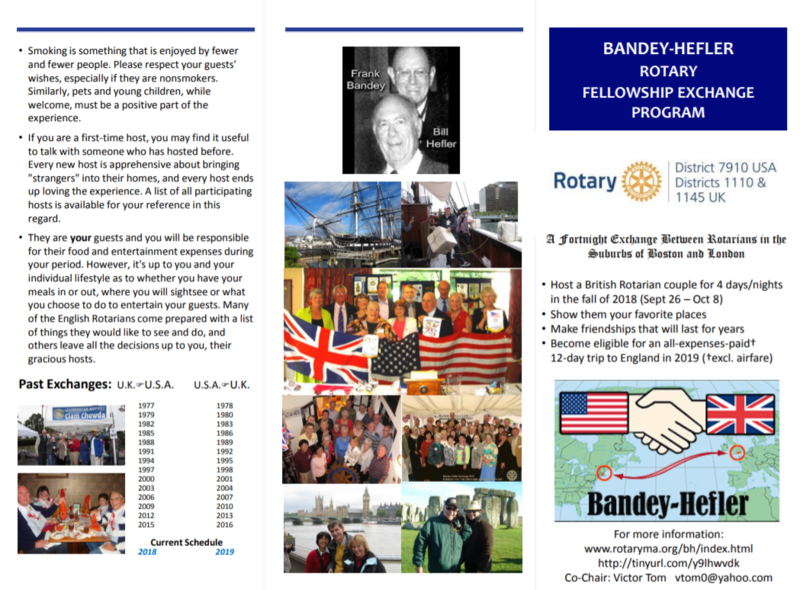 Bandy-Hefler Exchange program is an exchange program with England. 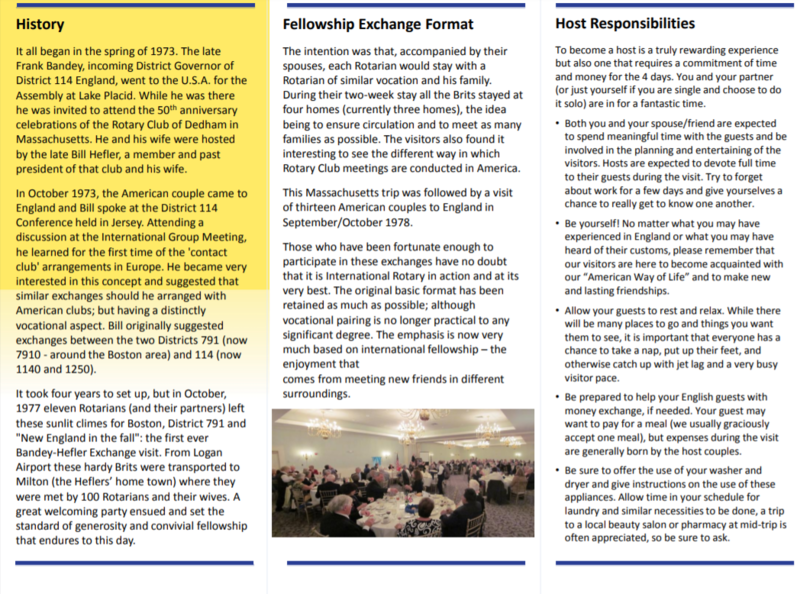 This coming September, we are hosting couples and next Fall, US Rotarians will go to the UK. Watch video they showed here https://www.youtube.com/watch?v=2VDfP-kyEs8. As host, you house a couple for 3 to 4 days which sounds like a lot but goes by quickly. It is fun show them your favorite places, go out for meals, and get to know each other. Christine & Tom first hosted in 2015 and found they had a lot in common with their visitors, the days went by quickly and truly enjoyed each others company. When Christine & Tom went to England, they even spent time with their hosts kids. Rotary draws you together and everything else falls into place. 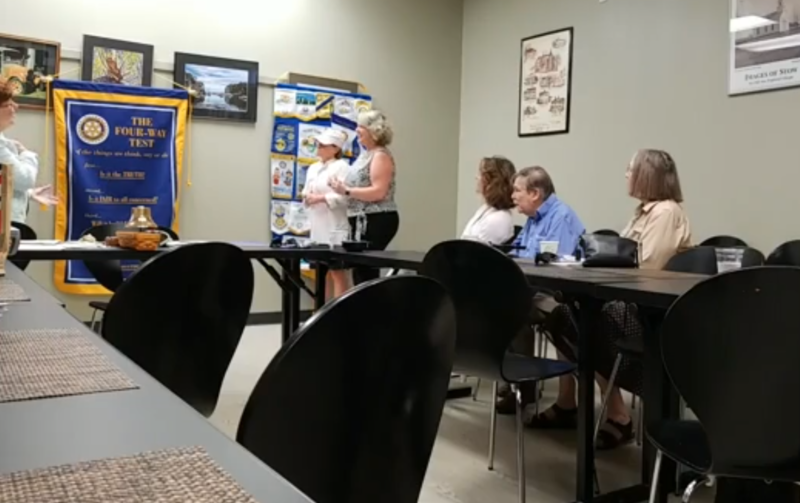 Looking for host Rotarians for September. Can work out entertainment with other Rotarians from other states for visiting other states, beaches, etc.